Out of all the cities in Japan, Tokyo was where I stayed the longest. 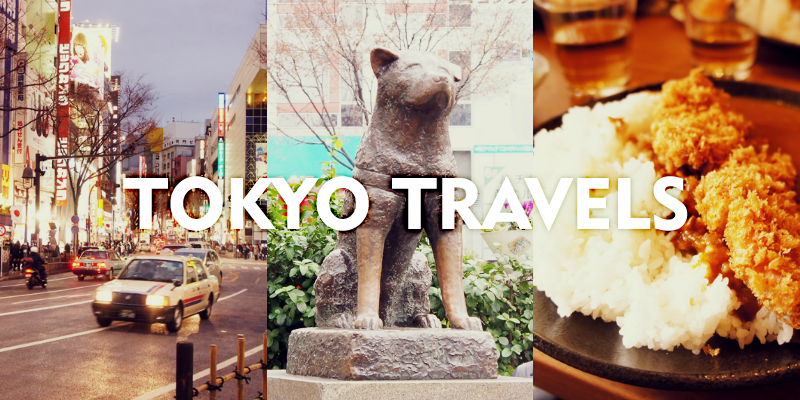 Tokyo is a pretty large city and if you have familiarized yourself with places you want to visit, you will most definitely be busy touring the streets every day. Not only is there hundreds of shops to purchase goods at, but there are plenty of unique eateries, historical attractions, gaming arcades, and more. My guide consists of just a portion of Tokyo because most of the information and photos I share are from Shibuya and Harajuku (popular shopping districts in Tokyo) but I hope it can give you an idea of where to begin or places you would like to include to your own itinerary. The first day my friends and I arrived in Tokyo, it was pouring outside so our first stop was a convenience store to purchase umbrellas. It was already evening so we also decided to just eat something small like onigiri and went straight to our hotel to check in. My friends and I stayed at two hotels during out entire stay in Tokyo. We stayed in Shinjuku during the beginning of our trip, traveled to Hiroshima, Mt Fuji, Osaka, and Kyoto, and then came back to Tokyo (Shinagawa district this time instead of Shinjuku again) towards the end of our Japan trip. Returning to Tokyo was the best option for us because our flight back home was in Narita International Airport and Tokyo was the closest out of all the cities we visited. The second day in Tokyo consisted of shopping so our first stop was Takeshita Street in Harajuku, which is filled with many small stores down the entire street. The next day, you can head to Shibuya Crossing which is the famous crosswalk of Japan where thousands of pedestrians cross every day. The surrounding area is filled with many business and endless shopping stores. It is very easy to get lost in the winding streets so try to focus on a couple of stores and keep a map with you. If you like department stores, you should check out Shibuya 109. It is a ten floor building filled with women's clothing, shoes, beauty products, and more. Beware that many of their apparel is one size. The men's department is a separate building on it's own. I also liked Tokyu Plaza because upon arriving at the entrance, you will get on an escalator surrounded by mirrors. It's pretty cool. At the top floor, they sell really adorable stationary and notebooks for those of you who like collecting those things. I would suggest staying in the Shibuya district til nightfall because that's when you get the spectacular view of the city lights. I do not have much information to share about Shinjuku and Shinagawa since most of our time was spent in the hotel at those locations. However, I can say that they also have many businesses like Shibuya and Harajuku. Shinjuku is pretty popular for their nightlife so it is a good place to stop at for dinner and entertainment. Everything in Shinjuku is pretty much located around Shinjuku Station, but don't underestimate how large the area is. My friends and I spent an hour getting lost try to figure out how to get on the other side of the station without having to go all the way around it. Shinagawa is a little more quiet when it comes to nightlife. You'll see many businessmen heading to work and streets are not as crowded. Overall, Tokyo is pretty easy to navigate and quick to get from district to district when you take the metro (Yamanote line) because the train just makes a circle to get to each of the districts. → One of the most popular metropolis in Japan and in the world. → Plane: Arrive at Narita International Airport. From there, you can take the train, bus, or taxi to your hotel. I took the train which was relatively cheaper than taxi, but I am not sure about bus. → Train/Metro: Before you travel to Japan, you can buy a JR Rail Pass at JRPass.com (available for purchase for $279 in the US, not available to Japanese residents) that will be shipped to your home via FedEx. This may save you a lot of money if you plan to travel via train several times in Japan (can also be used in the subway for JR lines). At the airport, there is a JR Pass service area where you show them your pass you received in the mail and they will give you the actual official pass that is stamped for you to use whenever you ride the train. The option I chose was a 7-consecutive day pass with unlimited usage within the 7 days, beginning the first day you use it in order to travel from city to city in Japan. Prior to boarding a train, seat reservation is available but not required. Just show your official pass at the gate and then you are free to board a train. Destinations and train times are listed on the monitors above you in the station, but be aware that there are faster and slower trains. The JR Rail Pass can also cover your subway transportation if you are using a JR Line; just ask at the gate. If you are ever lost, just ask an attendant as most are very helpful even with little English. → Beverage vending machine: Traditional vending machines that serve beverages that can be cold or warm. Some serve beer as well. → FamilyMart: These are convenience stores located all over the city (similar to 7-Eleven in the US). You can buy most of your basic necessities, magazines, candy, ramen, onigiri, alcohol, and snacks here. → Curry: A very common dish served with rice with vegetables or meat. → Onigiri: Trangular shaped food made from rice wrapped in seaweed. They come with different fillings (similar to sushi) such as salmon, tuna, and more. All you have to do is heat it up in the microwave and eat! → Ramen: Another common dish that is a noodle soup (on the salty side) served with meat, eggs, or vegetables. You can eat this at regular restaurants or ramen shop vending machines. → Harajuku: A popular, youthful shopping district with a variety of stores all on one street. You'll notice that teenagers dress a certain unique style in this area, which is common for them. → Diaso: A large franchise with several floors consisting of products selling for only 100-yen. From snacks to school supplies, you will find it all there. There is one located on Takeshita Street. → Tokyu Plaza: A fashion store with several floors located in Harajuku housing different designer brands and a cute rooftop. It was made famous for it's architecture and flashy entrance. → Shibuya Crossing: The famous Tokyo crosswalk just steps away from Shibuya Station. It is known as the busiest intersection in the world, yet it is managed very systematically. → Hachiko: Famous statue of the loyal dog Hachiko who waits for his owner at the train station (I suggest watching the movie Hachi, which is similar to Marley and Me and is based on a true story). → Photobooths: If you come across a store that is filled with giant photobooths, check it out and snap a few pictures with your family, friends, or significant other. Just choose which style of photobooth you want, insert money, and smile! → Shibuya 109: A ten floor department store located in Shibuya with more than 100 brands. Languages: Japanese is the official language but some may know English. Tipping: Tipping is not required nor expected at hotels, restaurants, or taxis. Wards: This is the term used for each of the districts within a city (e.g. Shinjuku is a ward of Tokyo). Hidden Stores: When walking the streets of Japan, you can always check out a building's directory because often times you will think that there are only a few selection of places to go in an area but many times, everything will be located above you. Many of the buildings have several floors because new stores can only go up since Japan is a densely populated area. You may end up finding a cute little cafe at the top floor of a business-looking building. My first photo after arriving in Shinjuku, Tokyo. Just like NYC, the streets are busy even when it rains. The entrance to Takeshita Street (Harajuku) and look, I spot a McDonalds! The vending machines here have more selections than in the US. Passed by a cute flower shop. The opposite entrance/exit to Takeshita Street. This curry dish was amazing in Harajuku. Diaso was the ultimate store to buy snacks and souvenirs. Just a few of the many photobooths in Tokyo. The view of Shibuya when you first exit Shibuya Station. I love Hachiko! It was such a good movie (Hachi - American version). A view of the Shibuya Crossing. Inside the store of Berska. Walking through the many shops of Shibuya. Just so you could see how tall this women's department store is. A peak of the gaming arcade in Shinjuku. I did not dare enter. Amazing post, so detailed !